I was talking to a childhood friend a number of years ago, we’d been reaquainted when we were planning one of our class reunions. She admitted that she was a bit of a bully as a kid. We graduated with about 61 kids. The majority of us grew up together, twinsie and I came to town in November of first grade, some kids came and went, but a good many of us can name all the teachers from first grade on. My friend said that she wishes she could take back the things she said then, the hurt she caused, and I could see how honest those words were. Her face was awash with sadness and pain that only that kind of confession and regret could garner. I wasn’t a bully, I mean really? But, I do remember bullying happening and watching with sadness. I mean, who’d go up against the mean girls, right? It was very scary, but no more than to the person being bullied. That’s my regret, I remember the faces too, I remember the words that were said, and the pain they caused, and I didn’t do anything at all, except maybe stick around after the mean ones had gone and try to comfort the injured. I licked my own wounds from the names called me. The carnage of words leave deep wounds that are scars on souls that people don’t see. 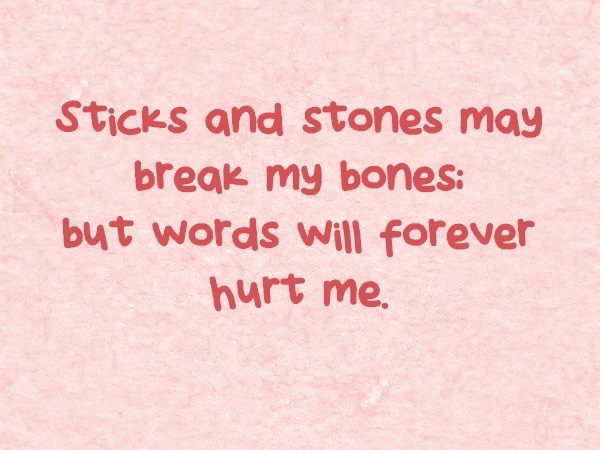 “Sticks and stones can break my bones but words will never hurt me…” We used to say that as kids, maybe stick out our tongues at our sisters, brothers or friends, but it’s not true, that’s the worst lie we ever said. Words damage the core of a person, they damage the beauty of a person, they change the way a person thinks about his or herself. Words hurt more than any broken bone, because bones mend and souls don’t as easily. These are the words we hear when we doubt ourselves, when we look in the mirror, or seek the courage to go for that promotion, or ﻿job interview… Stupid. Ugly. Fat. Carpenter’s Dream (Flat as a board and thin as a nail, this one was particularly harsh for 7th grader me.) Dumb. Retard. Failure. Delinquent. Pig. And worse names that I just can’t put into writing. These are the words of bullies, and there are new ones now, and new ways to shoot those painful arrows through texts and tweets and facebook pages. And it’s not just the young, it’s all ages and people gaining control by getting in “here” (in our heads) reinforcing the words that stung and stuck so long ago. And it’s isolating, and it’s painful, and we all remember, now don’t we? So, where’s the hope in all of this if you were the bully, the standby, or the bullied, or maybe you were all three? And a few of those men and women came to that reunion. When everyone came together, there was a genuine sense of healing. Twenty or more years later, yah, but healing. We danced, we ate, we drank, we talked about old times, and we reveled in the discovery of the new. A lovely, heartfelt post (as always). You are such an inspiration! Having just attending my 50th high school reunion (gulp-how’d I get this old?! ), sadly that amount of time didn’t do much to blunt the mean kids. They were still mean, insecure but in a turn of poetic justice, many of them were quite overweight. Their current meanness stung the same as it did 50 years ago. Was I glad I went, mostly. There were a few people I genuinely enjoyed seeing after all these years and their cores were true and strong. I certainly hope I’ve changed and evolved into a better human being than I was back then. The best thing to come from those long ago cruelties is the forgiveness I felt. It’s good to let those things go and live life as a kind and decent human. Such a treat to see your post. You’ve been on my mind and I hope you are well. Hi Monika, It’s odd to have so many years pass, we are still young, and our doggies keep us younger, in my humble opinion. I truly believe that Bullies are people with such great hurt deep down that they can’t help but hurt others. When people fall behind them, they are empowered, and so the cycle begins. I know a few of them really suffered in their life, and that pains me, too. But, there is that sense that “poetic justice” has been served. Still, one hurt over another. Therein lies the rub for me. We are fine, two weddings in 6 months, and a ton of other stuff simply has overloaded my writer’s brain. I want to do a pictorial blog to cover my absence. I have had people ask, and that is so fine.